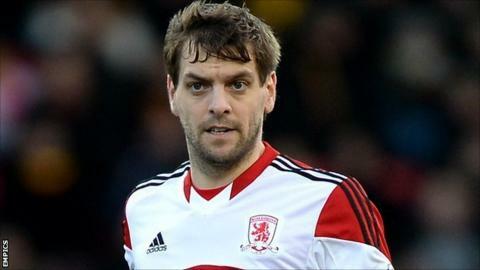 Defender Jonathan Woodgate says a strong finish to the season will benefit Middlesbrough in their preparations for the 2014-15 campaign. With five games to play, Boro have won three Championship games in a row but are likely to miss out on the play-offs as they have an eight-point deficit. "It's important for attracting new players," Woodgate told BBC Tees. "You want to finish close to the play-offs and have a winning mentality to take into next year." The 34-year-old added: "We want to keep the belief and determination. Hopefully we can kick on with that next season and it stays with us." Woodgate made a surprise return to the Boro squad for the 3-1 win against Birmingham on Tuesday, coming on after 20 minutes to replace the injured George Friend. It was the former England defender's first appearance since early March, as he continues to battle an ongoing calf problem. "I only trained for eight minutes yesterday, but when the team needs you, you have to be there for them," he added. "I didn't plan on getting on but when George went down injured they asked if I could go on and I said no problem. "I gave it my best shot and luckily it paid off."